Tawny frogmouths are large, big-headed birds that can measure from 34 to 53 cm (13 to 21 in) long. Weights have been recorded up to 680 g (1.50 lb) in the wild (and perhaps even more in captivity), but these are exceptionally high. In the nominate race, 55 males were found to weigh a mean of 354 g (12.5 oz), while 39 females weighed a mean of 297 g (10.5 oz), with a range between both of 157 to 555 g (5.5 to 19.6 oz). Among the subspecies P. s. brachypterus, 20 unsexed birds were found to average 278 g (9.8 oz) with a range of 185 to 416 g (6.5 to 14.7 oz). In P. s. phalaenoides, a weight range of 205 to 364 g (7.2 to 12.8 oz) was reported. Thus, in terms of average if not maximal body mass, the tawny is a bit smaller than its relative, the Papuan frogmouth. Tawny frogmouths are stocky and compact with rounded wings and short legs. They have wide, heavy, olive-grey to blackish bills that are hooked at the tip and topped with distinctive tufts of bristles. Their eyes are large, yellow, and frontally placed, a trait shared by owls. Tawny frogmouths have three distinct colour morphs, grey being the most common in both sexes. Males of this morph have silver-grey upperparts with black streaks and slightly paler underparts with white barring and brown to rufous mottling. Females of this morph are often darker with more rufous mottling. Females of the subspecies P. s. strigoides have a chestnut morph and females of the subspecies P. s. phalaenoides have a rufous morph Leucistic or albinistic all-white aberrant plumage for this species has been documented. One of the best examples of cryptic plumage and mimicry in Australian birds is seen in the tawny frogmouth which perch low on tree branches during the day camouflaged as part of the tree. Their silvery-grey plumage patterned with white, black, and brown streaks and mottles allows them to freeze into the form of a broken tree branch and become practically invisible in broad daylight. The tawny frogmouth often chooses a broken part of a tree branch and perches upon it with its head thrust upwards at an acute angle using its very large, broad beak to emphasise the resemblance. Often, a pair sits together and points their heads upwards, only breaking cover if approached closely to take flight or warn off predators. 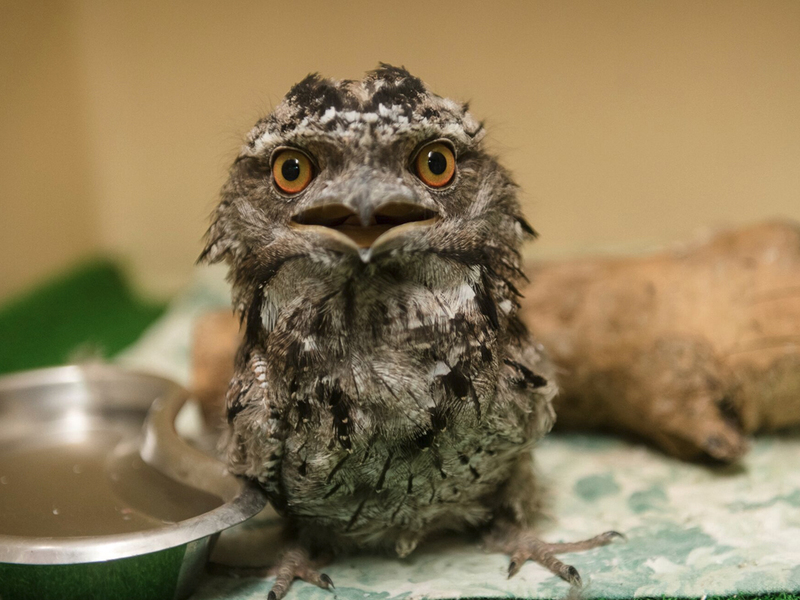 When threatened, adult tawny frogmouths make an alarm call that signals to chicks to remain silent and immobile, ensuring that the natural camouflage provided by the plumage is not broken.